Howard Fairbank was born and brought up in South Africa. Having trained as a chemical engineer and gained an MBA, he rose to executive director level in charge of 2,500 people in a multi-national oil company. He became a ruthlessly competitive turn-around expert and corporate maverick, the youngest person ever to have held such high positions within the corporation. He was married, a successful sportsman and widely travelled. He was committed to climbing the Good Life, but he had a conflicting long held dream to break free and experience the intensity of Nature’s Grand Adventure. Deciding to transform his life he moved to Sydney, Australia, where he became a venture capitalist, giving himself seven years to create the necessary wealth to set himself free of The System, and pursue that dream. 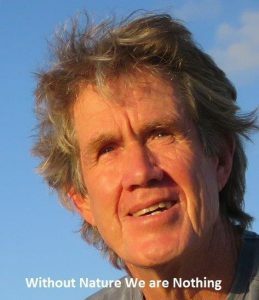 At the age of 47, after a number of successful business adventures, he left Australia and became an explorer, living on his boat or in his one-man tent, which he carried with him on his bike, or in his kayak, as he travelled alone in the most challenging terrains of the world, sailing solo across oceans, trekking to the Poles and cycling across continents, as well as spending time as an outsider in cities of the world. His purpose was to explore the Truths, and extreme adventure was his method. He wanted to explore himself, society and the planet, and discover another way of life outside the capitalist system. From 2004 to 2015 he wandered and explored in the broadest possible way, experiencing life in the remotest communities as well as the biggest cities. He sailed solo nearly half way across the world, including two Atlantic crossings, and trekked to both the North and South Poles, tackling the desolation of Antarctica and the South Pole on his own. He cycled the length of Africa and cycled and kayaked across untouched wildernesses from Alaska and Siberia to the jungles and deserts of Africa and the mountains of Patagonia. He had to learn to survive as an outsider amongst the crowds in cities like London as well as living a fulfilling life alone, deep in Nature’s wilderness, or immersed in traditional societies. He was forced to transform who he was because sometimes it meant the difference between surviving and dying. The anthropocentric, western values, which he had required for success in the capitalist world, often clashed with Nature’s values. As the intensity of his life increased he liked who he became, a radiant creature of Nature again. He also gradually came to understand how the capitalist system that he had been part of has triumphed, and how the greed implicit in that system is wrecking the planet at an unprecedented, exponentially increasing rate. As capitalist anthropocentrics, humans are living outside Nature’s sustainable value system and the consequences are devastating. Having broken free and learnt to live intensely within Nature’s restraints, Howard Fairbank is rare, living proof that the ‘One-percent’ don’t need to lead the destruction of the planet and he feels a deep calling to share this experience in order to help humanity. One Point Zero is for this purpose and its goal is to inspire others to take on their own ‘walking the talk’, activist role in helping catalyse Society’s transformation, to solve its unprecedented Identity and Belonging crisis.